In this blog article we touch the subject of architectural evaluation methodology. We took the effort to interview some experts and collect opinions from experts on this subject. While everyone raises unique points, there seems to be some consensus.. The picture below is a good take-away. If your idea has good paradigm compatibility then simulate! Yes, some revolutionary ideas can have good paradigm compatibility (e.g. SMT). Of course be careful about your simulator configuration and verify its ground truth. If your idea requires a software overhaul – perhaps take the effort to build an FPGA prototype. FPGAs will provide the speed you need to run the new software stack. If your idea is incompatible with conventional paradigms or has components which today’s digital circuits can’t mimic – go forward and build a prototype. Show the faith and put in the effort! Even then be smart about choosing which component of your system to prototype and which components can be simulated. Minimize the pain. Hopefully the open-source hardware movement will be one way to minimize the pain. *Disclaimer: The para above is my views based on expert opinions and own experience. It does not reflect any one expert’s opinion. When to Prototype? When to Simulate? When to emulate on FPGAs? Snippets from experts in alphabetical order : Todd Austin, David Brooks, Doug Burger, Lieven Eeckhout, Babak Falsafi, Karu Sankaralingam, Michael Taylor, David Wentzlaff. Todd Austin “I will rephrase the question to – when can I not simulate? Prototyping is expensive both in terms of time, money and opportunity costs. One could potentially invest the time in other innovative research. It is not clear what can be learned by fabricating ASICs which cannot be learned from just completing design-time backend-placement – the last step before fabing an ASIC. Sometimes, the outcome of an ASIC is a validation of backend tools, which isn’t very valuable. So, when can I not simulate? When there are parts of your system which are not 100% digital. For example our Razor project taped out a chip to test metastability issues, and we recently taped out the A2 malicious circuit chip to test analog attacks. Another example is your compute cache work which does in-cache gymnastics on bit-lines. Even in these scenarios you only need to fabricate a piece of the system which actually has the mixed-signal characteristics – for instance in Razor, we did not fabricate a complex multi-processor. Beyond providing a window into the analog portions of your design, prototyping has the added advantage of high visibility. Prototyped projects generate a lot of attention and become a lightning rod of interest – so if you do go the route of building a chip, there is a good payback in project visibility for the expensive cost. David Brooks “There are at least three scenarios where prototyping can help. First, when the research includes a new circuit (e.g. 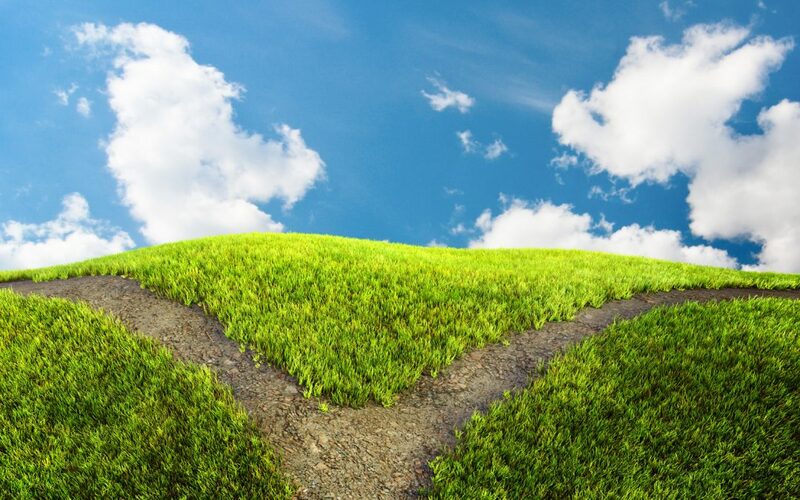 mixed signal analog-digital) or operating paradigm (e.g. near-threshold computing) in which the physical characteristics are hard to capture in high-speed, high-fidelity simulations. Such ideas are best evaluated in prototypes and ideally lend themselves to publications in both the VLSI and computer architecture communities. A circuit precursor shouldn’t negate the architectural contributions, in fact it makes them more tangible. But it isn’t necessary to build a Xeon processor. A small chip focused on the novel circuit component is sufficient and simulations can bridge the gap to larger systems. The second scenario is when the research has a critical software component. As examples, recall the RAW and TRIPS projects from MIT and UT-Austin respectively. These architectures required new OS and compiler infrastructure. It is hard to motivate software researchers to write code for a machine that doesn’t (and may never) exist. Of course, the added benefit is that the prototype will be orders of magnitude faster than simulations. Third, when researchers contemplate a start-up or other tech transfer. The recent surge in silicon startups is a boon for the computer architecture community. Silicon prototyping is useful to transition technology from a research lab to a start-up. Investors want to see something tangible and proof that the team can take ideas to the next level. Prototyping provides credibility and visibility, and Berkeley’s succession of RISC-V chips is a great example of this. These are three scenarios when prototyping can make a big difference. Otherwise simulate! Simulations are great for getting ideas out in a rapidly moving field or evaluating ideas which build on top of well understood baselines. Consider simultaneous multi-threading. The intuition behind the idea was backed up with simulations. Although the idea was revolutionary, it built on top of a well-known micro-architecture so industry practitioners could immediately see the value. Another scenario where simulation is necessary is where the core technology (e.g. 3D stacking or other advanced packaging technologies) is not mature enough to be available. 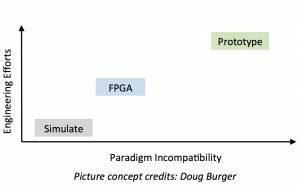 Of the three scenarios described, FPGAs can be quite useful for the second scenario – new architecture that also require an overhaul of the software stack. If we were to re-do the TRIPS project with today’s available high-end FPGAs, an FPGA prototype may be sufficient. FPGAs are perhaps not that useful for startups, because they often can’t provide power-performance quality of design metrics equivalent to ASICs. They are least useful for the first scenario because it is hard to emulate physical characteristics in an FPGA. Doug Burger “It’s not just simulation or prototyping. There are three buckets: modelling, simulation, and prototyping. In many scenarios modelling is sufficient – think how many times you have used Amdahl’s law or Little’s law. However as system complexity grows, simulations become more important. Simulations are really useful when the paradigm is well understood and researchers have a good mental model. SimpleScalar is a great example. Everyone knew how an out-of-order core works. Simulations were good to evaluate techniques which extending it or improving it. Lieven Eeckhout “There is no single tool or methodology that fits all needs. We need to pick the right tool for the job. For some experiments, this may be cycle-accurate simulation. For others, this may be hardware prototyping. For yet other experiments, this may be analytical modeling. The key point is to make sure the methodology is appropriate and drives the architect in the right direction. An inappropriate methodology may lead to misleading or even incorrect conclusions. For chip-level or system-level performance evaluation, I’d argue for raising the level of abstraction in architectural simulation. Cycle-accurate simulation is simply too slow to simulate the entire chip or system. Ironically, the level of detail gets in the way of accuracy, i.e., because the simulator is so detailed, it is extremely slow and hence one cannot use the tool to simulate large systems nor can one simulate a representative long-running workload. Hardware prototyping using FPGAs enables modeling large systems at a sufficiently high simulation speed, however, simulator development and setup time may be impractical. Babak Falsafi “The days of sticking to one simulator and one set of workloads are over (used to be SimpleScalar and SPEC, now gem5 and SPEC/PARSEC). The post-Dennard, post-Moore era calls for using the right tools at the right time. To make a strong case for a design we need to pick the right set of tools to measure performance, power and area. Profile-based sampling (common practice) works for user-level apps with distinct phases (e.g., DNN’s, graph processing). Workloads with deep software stacks and frequent interaction among software layers not only require much larger measurement windows (e.g., TPC or server workloads) but also are often not phase-based. One practical way of extracting a representative measurement from them is statistical sampling (e.g., SMARTS). Karu Sankaralingam “When simulations are used, the most important thing that researchers must realize is that simulators are not meant to be used as black boxes. They should at least internally verify their simulators and understand the details of how they work for the scenarios they are considering in their research. Researchers must also be extremely cautious when using these tools for configurations outside the validated point. Furthermore, it is very useful to consider simple first order models as well instead of always looking for cycle-level simulation. When ideas span multiple layers of the system stack cycle-level simulation becomes less and less important and useful. Michael Taylor “I employ both simulation and prototyping extensively in my research group. Prototyping great strength is that it exposes your design to the three iron laws: Physics, Amdahl, and Real World Crap. Prototyping autocorrects those simulator bugs, and often exposes the real challenges in building systems. Some ideas are particularly sensitive to the laws of physics and make a lot of sense to prototype to just make the research believable; for example, operating at near threshold or protecting from power side-channel attacks. Or, anything that is truly transformative in terms of energy/power. Other ideas, for example, the MIT Raw Tiled architecture and UCSD GreenDroid, result in systems that are very different than prior designs and need to have a reasonable baseline implementation that enables accurate simulators and enough confidence for follow on research to be done. Especially with the availability of open source processors like Berkeley’s Rocket generator, reusable IP libraries like Basejump STL, ASIC bootstrap infrastructure like Basejump and HLS, it becomes possible to prototype real versions of your system with far less effort and time than ever before. Our recent Celerity SoC tapeout had 5 Linux-capable Rocket cores, a 496-core manycore, a binarized neural network accelerator and a high-speed I/O interface. My team, Chris Batten’s team, and Ron Dreslinski’s team taped this out in TSMC 16nm in 12 months. Why mess with simulators when you can build the real thing? All of the team members learned a ton about designing HW, and we get to explore creative designs far outside of what industry is doing.